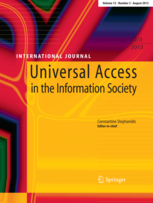 Antonio Giovanni Schiavone, Fabio Paternò: “An extensible environment for guidelinebased accessibility evaluation of dynamic Web-applications“, Universal Access in the Information Society v. 14, no. 1 (March 2015): 111-132 Print. Fabio Paternò, Antonio Giovanni Schiavone, Antonio Conti: “Customizable Automatic Detection of Bad Usability Smells in Mobile Accessed Web Applications“, Proceedings of the 19th International Conference on Human-Computer Interaction with Mobile Devices and Services (MobileHCI 2017).